By Jove: NASA Says Juno Craft Is Orbiting Jupiter : The Two-Way "And now the fun begins," says a leader of the mission to the large planet whose radiation and dust particles posed dangerous challenges. Project leaders call Juno "a milestone for planetary science." Before turning all of its attention to an orbit insertion at Jupiter, the Juno craft took this image of its target planet and surrounding moons. After a nearly five-year journey, NASA's solar-powered Juno spacecraft achieved orbit around Jupiter on Monday night. Juno navigated a tricky maneuver — including slowing by around 1,212 mph — to insert itself into orbit in what NASA calls "the king of our solar system." At 11:18 p.m. 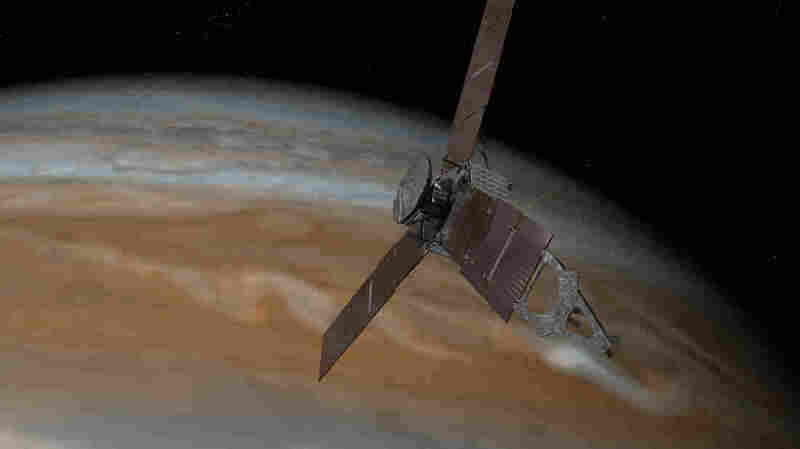 ET, Juno transmitted a radio signal to Earth that meant its main engine had switched on. It stayed on for 35 minutes, placing Juno into exactly the orbit that mission managers had planned for. At a news conference after the successful maneuver, a broadly smiling Rick Nybakken, the Juno project manager, held up a sheaf of papers. "We prepared a contingency communications procedure," he said, just in case the engine didn't fire and the mission was a failure. With a flourish he tore it in half. "We don't need it." 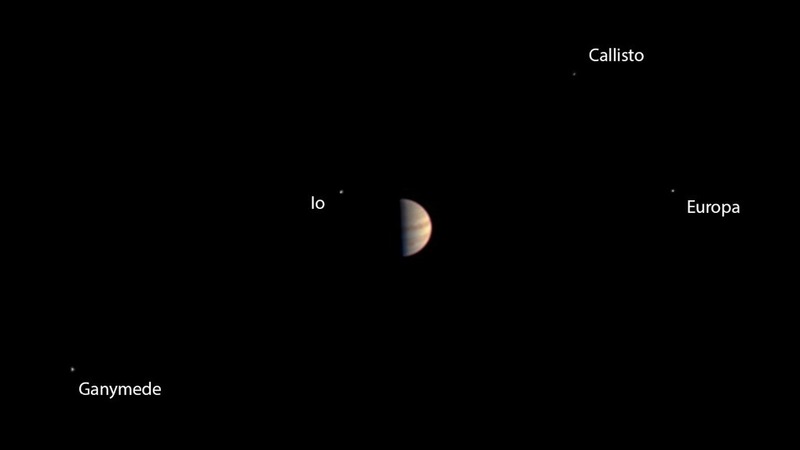 "And now the fun begins," said Scott Bolton, Juno principal investigator. "The science." Over the coming days and weeks, mission managers will be instructing the spacecraft to turn its scientific instruments back on. They were all turned off for the insertion maneuver to reduce the risk of a computer glitch. The instruments won't make their first close-up measurements of Jupiter until the end of August. That's because Juno is in a large, oval-shaped orbit that takes it far from the planet, only returning to Jupiter 53.5 days after it first arrived. NASA also released a movie made from pictures taken by Juno as it approached Jupiter. It shows Jupiter's four largest moons, Calisto, Ganymede, Europa and Io, orbiting the giant planet. "It's a milestone for planetary science," NASA Director of Planetary Science Jim Green said at a news conference before the successful maneuver, adding that the Juno mission should provide far more data than has been gleaned from fly-by trips past the gas giant. When it named this mission, NASA acknowledged its difficulty. Juno was a Roman goddess, the agency notes, "who was Jupiter's wife, and who could also see through clouds." As of noon Monday, Juno was an hour away from passing Jupiter's second-closest moon, Europa, with only Io remaining to pass, Juno Principal Investigator Scott Bolton said. He added, "It's getting very real." Bolton went on to discuss what he called "the true hazard" of Jupiter — its massively powerful radiation belts that send electrons, protons and ions whizzing around the planet at nearly the speed of light. Those particles could wreak havoc with Juno's electronics. As he described the difficulty of getting a spacecraft through that radiation, Bolton also noted Jupiter's ring of debris that could present real problems to Juno's engine — which will need to have its nozzle open and pointed toward the planet to take speed off of the craft. In a maneuver that will begin tonight, Juno will approach Jupiter from high over the planet's north pole, said Rick Nybakken, Juno's project manager from NASA's Jet Propulsion Laboratory in Pasadena, Calif. The craft will then slide along the planet's surface, fire its main engine to brake, and alter its own rotation and placement so that its solar array is pointed toward the sun. There's a 48-minute time delay for communication with the spacecraft, which means NASA won't start to learn the effects of the 35-minute engine burn for some 13 minutes after the burn completes. NPR's Joe Palca reports that if the orbit insertion goes smoothly, "Juno will provide a lot of answers to questions about Jupiter. Although it's well-known that the gas giant is made up primarily of hydrogen and helium gas, the planet's core remains mysterious." Juno has a hexagonal body — measuring 11.5 feet in diameter — that projects three solar arrays that each measure 29.5 feet by 8.7 feet. Bolton says the spacecraft's 60 square meters (more than 650 square feet) of solar arrays produce 500 watts of power. NASA plans for Juno to orbit Jupiter 37 times over the next 20 months as it provides new information about the gas giant's core and composition. NASA has been following the spacecraft's progress here.